Hi guys! So, I know it’s not technically summer yet, but the weather is speaking otherwise! Plus, my kids only have a week of school left and I know a number of yours are already out. So, summer it is. 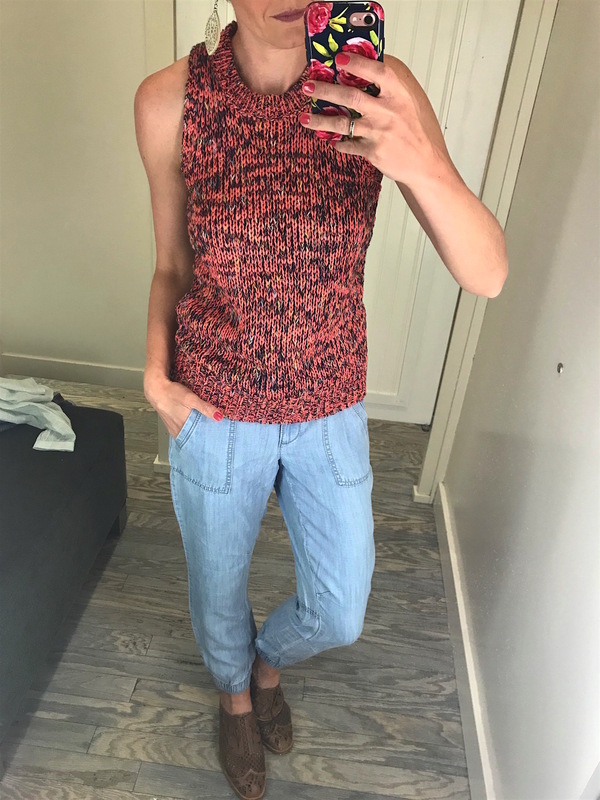 Today I pulled together some of my essential summer pieces. I’ll go into a bit of detail as to why I selected each of these items below, but they are all things that I would hate to be without all summer long! Summer Tote: An obvious essential for on-the-go moms. The best part is, it can be stylish to carry around water bottles, snacks, towels, sunscreen etc. for any number of kids! This bag also comes in white and they’re both currently on sale. Stila All Day Lipstick: I get asked about this lipstick on my Insta-stories regularly. I love it because it lasts for the better part of the day as I don’t often remember to reapply, especially during the summer months! My two favorite colors are Portofino and Baci. Birkenstocks: I bought these sandals in copper last year and am eyeing up the pink to add for this year! 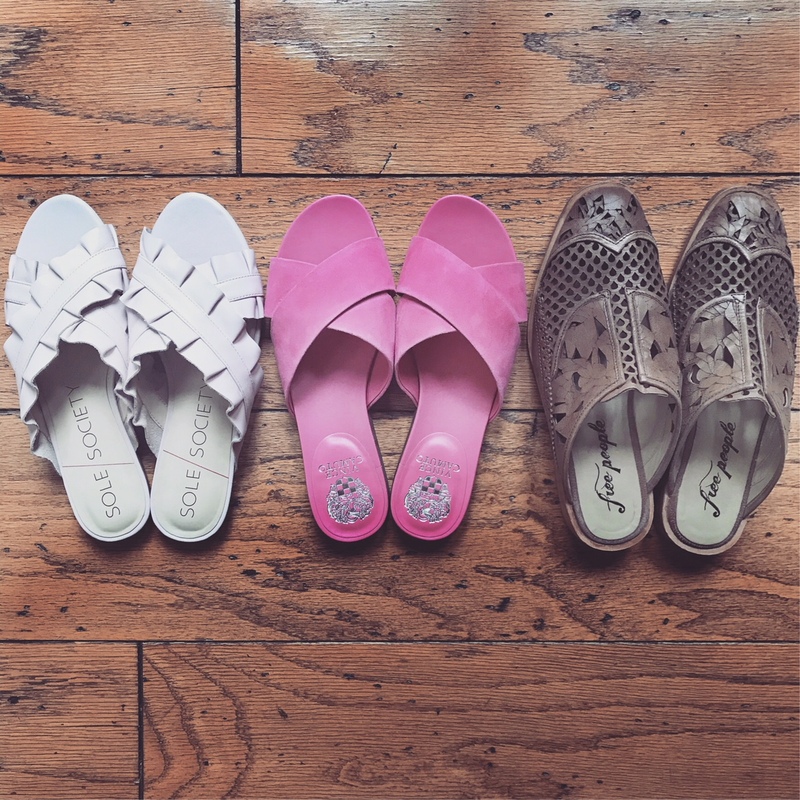 I wanted a waterproof sandal that I could throw on for the pool as well as our beach trip, but they ended up being the sandals that I slip on constantly as I’m in and out of the house with the kids playing outside, cooking outdoors, running quick errands….they’re perfect to slip on and off and they’re super comfortable too! I can’t recommend these enough. CamelBak Water Bottle: My new years resolution was to drink more water daily. Although I don’t meet my goal everyday, the only way I get close is by keeping my bottle by my side all day. Hydration is even more important during the summer months, not only for the kids, but yourself too! LeSpecs Sunglasses: I own a few pairs of LeSpecs, which you probably know if you’ve followed along for a while now. They have great style, great comfort and are at a great price-point. This pair in particular is my favorite for summer-time. They look great with a suntan! 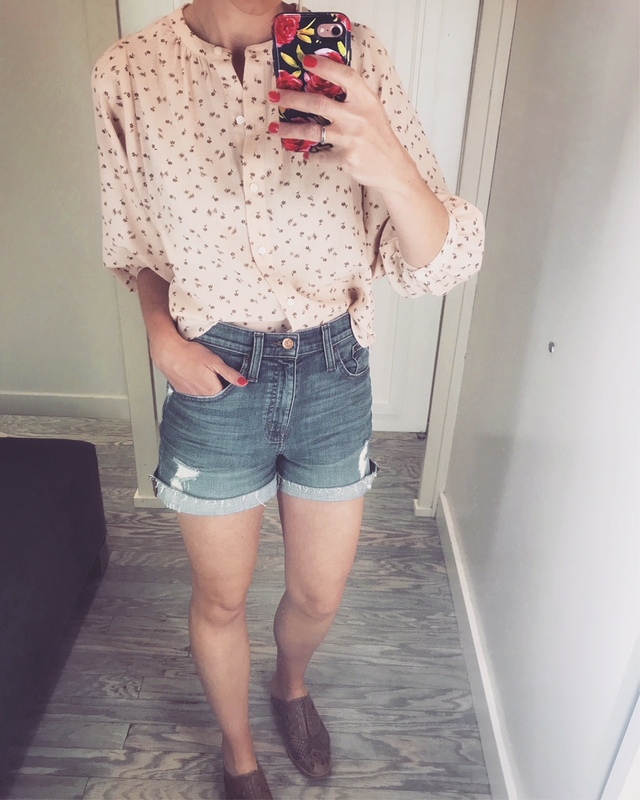 JCrew High-rise Denim Shorts: I have a similar pair of denim shorts from last year and they’re likely to be my go-to’s once again. I’m a high-waist fanatic when it comes to denim and that goes for shorts too. A little front tuck with the t-shirt and you actually look like you’re making an effort! Essie Gel Nail Polish: This is new-ish to me, but actually has me doing my nails again on a somewhat regular basis. A typical manicure only lasts me a few days, but this stuff stays on for a solid week! And I can get a good month with my pedicure. I do my own nails these days, and the brush on this polish makes all the difference in the world. It’s curved on the edges instead of being straight and for the life of me, I can’t figure out why no one came up with this idea before?! Anyone else try this? Do you agree? Memorial Day Sales Not to Miss! It’s hard to believe that Memorial Day weekend is already upon us! We are ready for grilling and swimming and carnivals and s’mores and all that summer brings with it. With everything kicking off this weekend, you know the sales are in full swing! Below you can find some sales worth checking out as well as a number of my favorite picks from each! I was finally able to get some pictures of this adorable wrap romper. It appears to be a dress, yet has the bonus of shorts underneath! 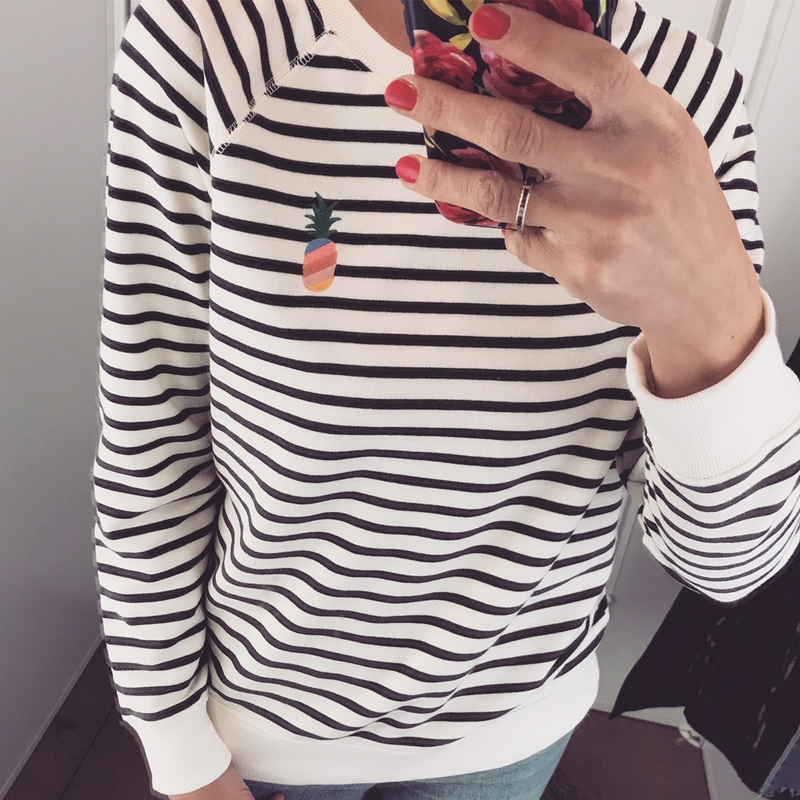 It’s unfortunately sold out online (you may be able to track it down in store) but I found a bunch of similar options for you to check out below (love this one that’s also on sale today). 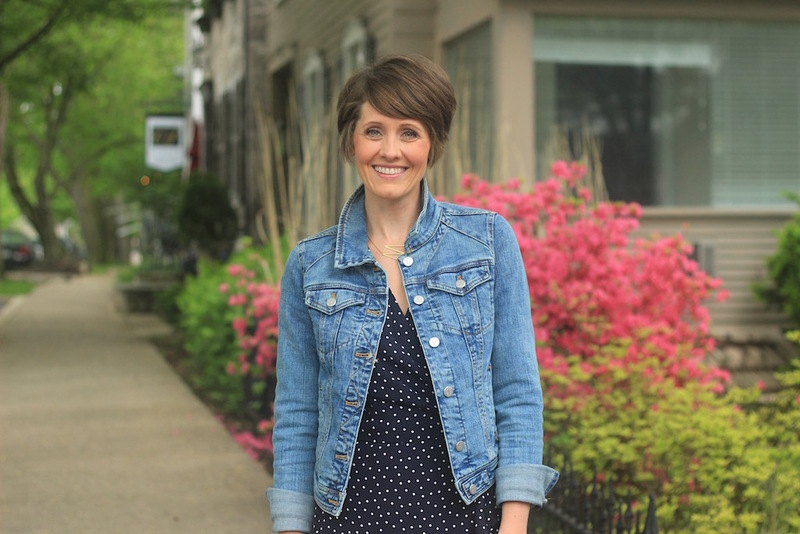 Navy + white polka dots is always a winning combo, it’s hard to go wrong there! This past weekend Jack and I celebrated the marriage of a high school friend of ours. 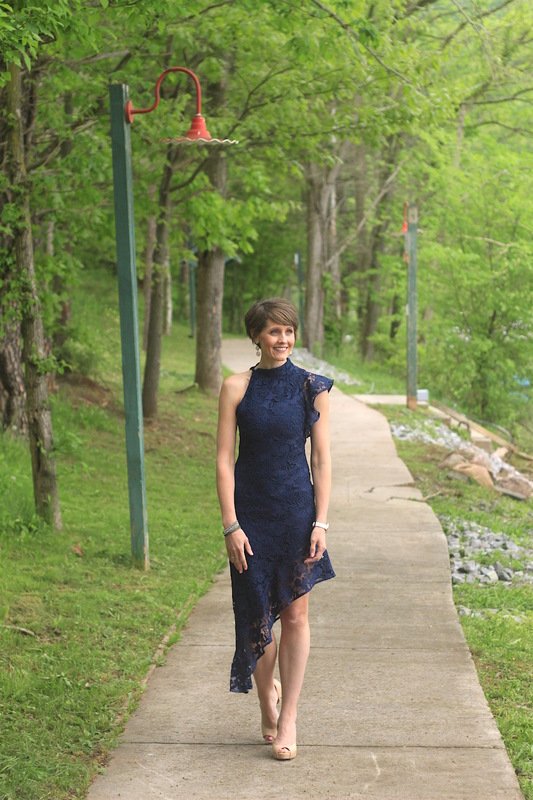 The weather graciously held off allowing the beautiful ceremony to commence outdoors by the water. We love any event that pulls all of our friends together again. My cheeks were so sore from all of the laughter we shared by the end of the night, which is typical with our group! 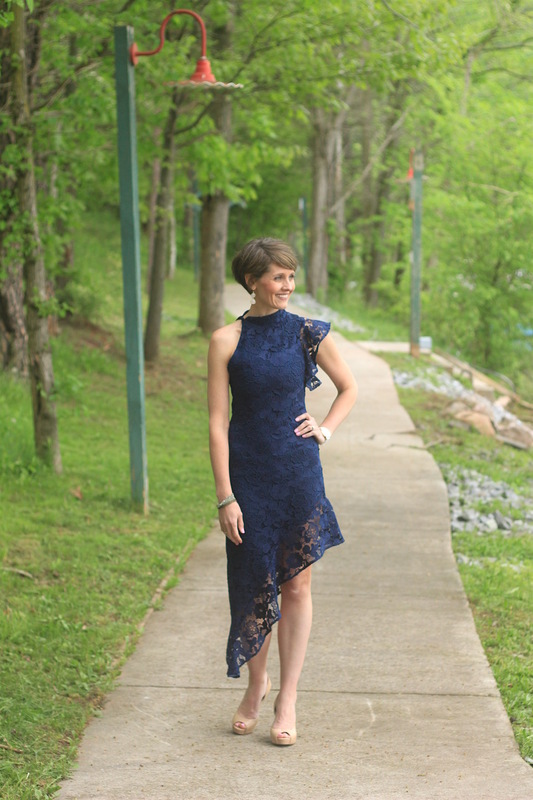 Rental dresses have become my go-to for weddings these days. 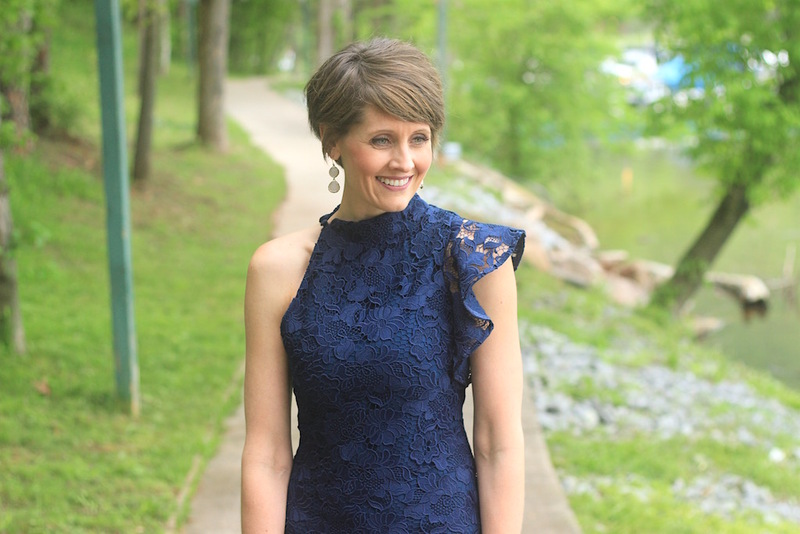 I’ve shared before my love for Rent the Runway (you can read more about them and see my all-time favorite rental here). I have yet to order a dress that hasn’t worked out for the best. The most reassuring part is that they send you two different sizes of your dress. 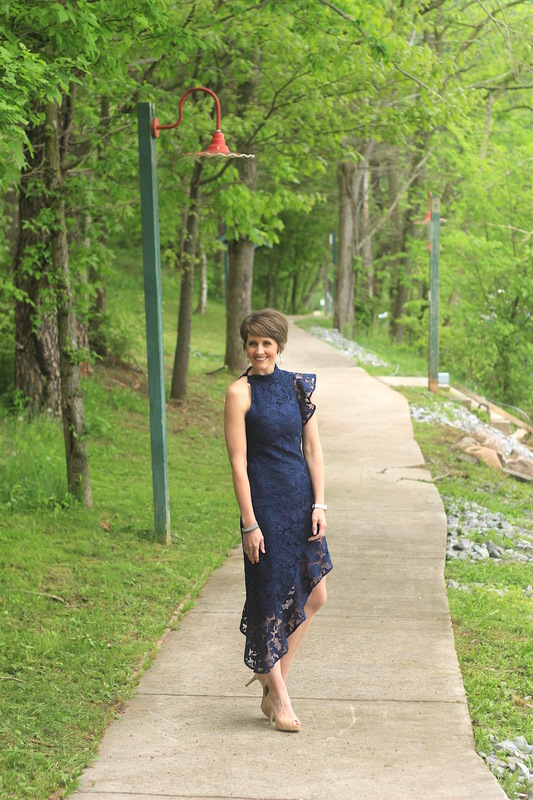 It’s comforting to know that at least one will fit ;) I received a ton a compliments on this navy lace dress. 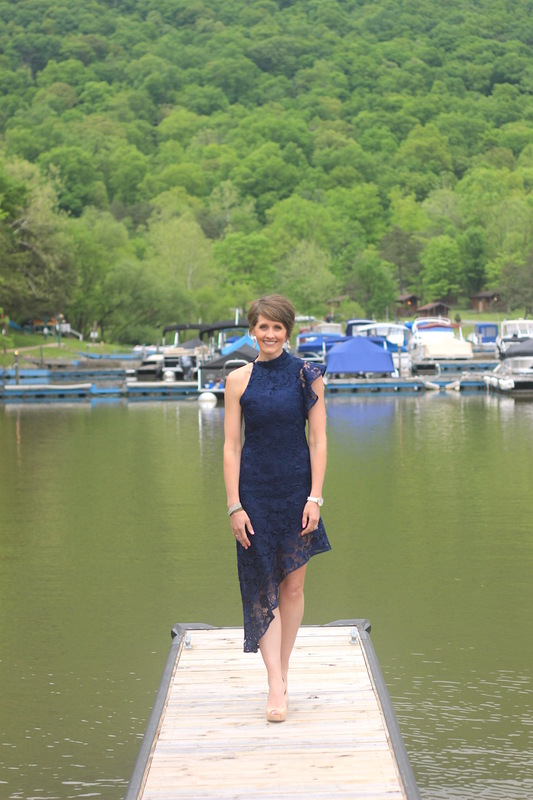 The neckline and asymmetrical hem were so playful, yet the overall look was elegant and classy. If you have yet to use RTR, you can use this link to get $30 off of your first order. They also pass on $30 towards my next rental so I can continue to share more with you! And if you have any questions about them just leave a comment or shoot me a message, I’m happy to answer! I picked up this sweater a couple of weeks ago and can’t stop wearing it. 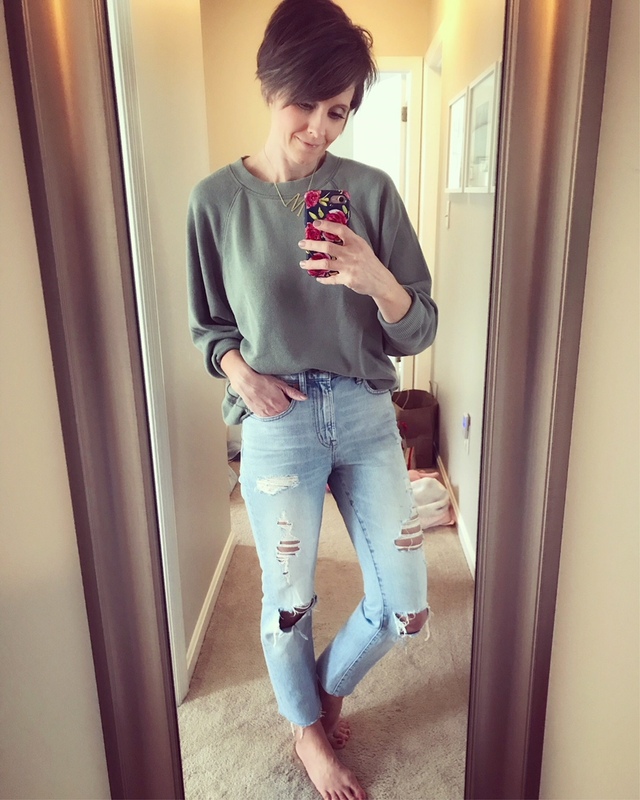 It’s such a great spring/summer sweater; light weight and breathable in the prettiest color. 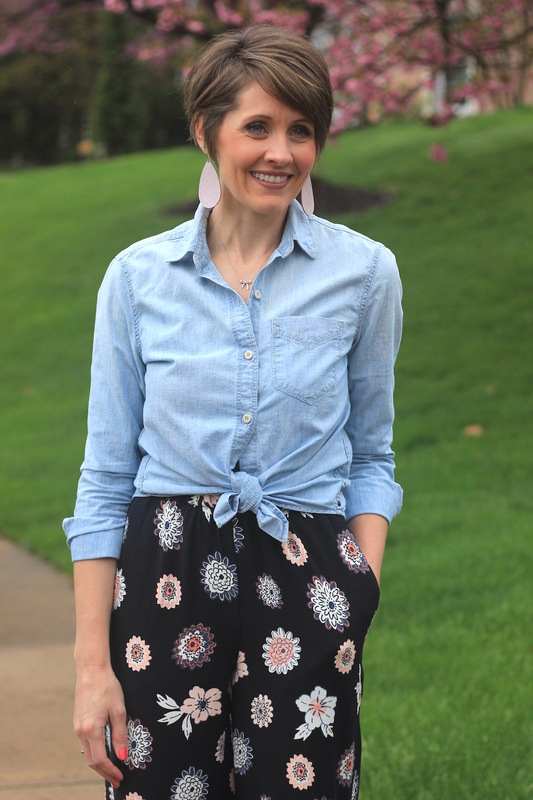 Starting to break out some shorts (these were my favorite last year) and pairing them with pretty spring tops for now. If I’m not in sneakers, chances are good you’ll find me in one of these three pretties! The one that I wish I had brought home with me. A rainbow pineapple for crying out loud! 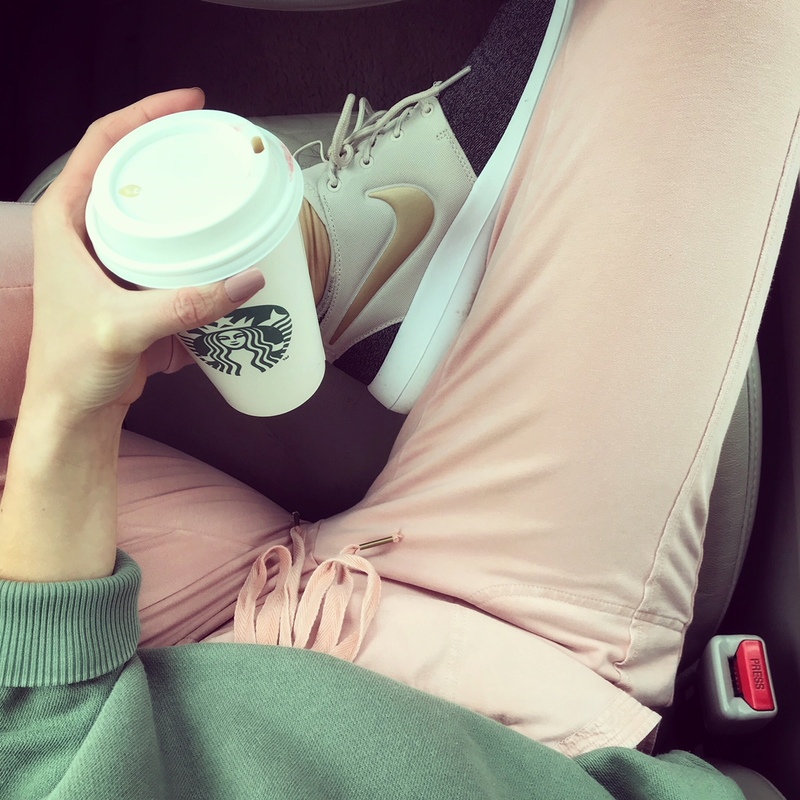 I don’t know why it took so long for me to have a pair of pink sweatpants, I love them! And this lightweight sweatshirt is the best! 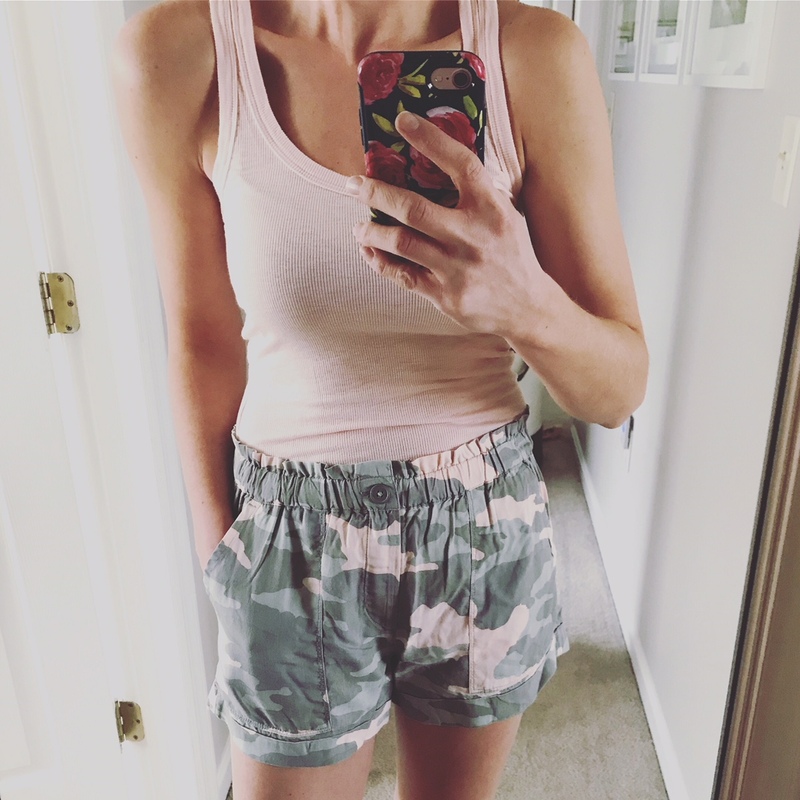 The cutest, comfiest and flattering shorts I’ve had a while. You can wear them with a tank, a sweatshirt, a chambray top or a basic tee! Must have’s for me. 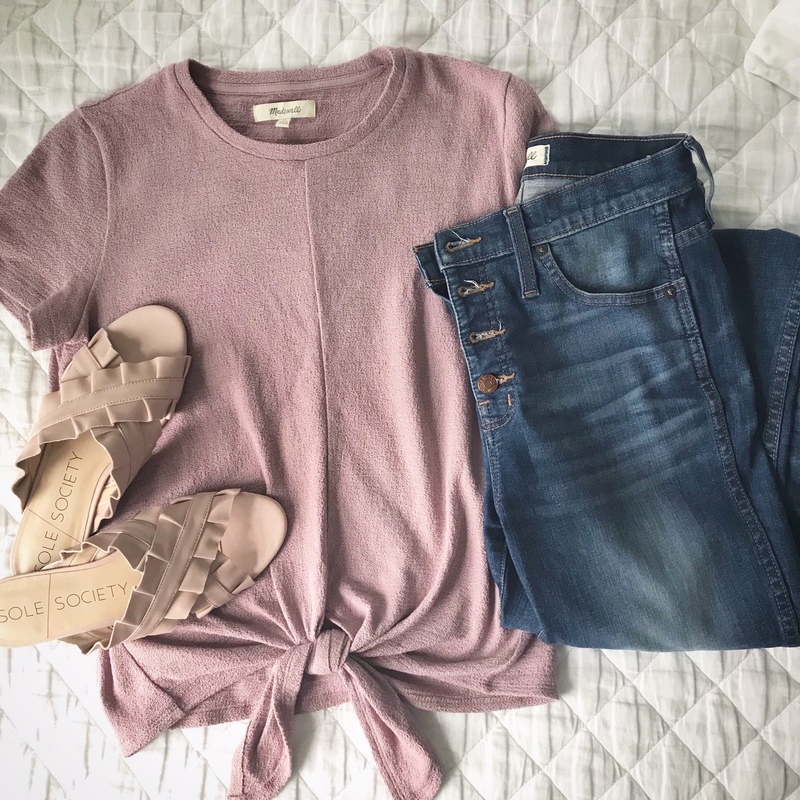 Just another combo of wearing some of my favorite comfy basics. 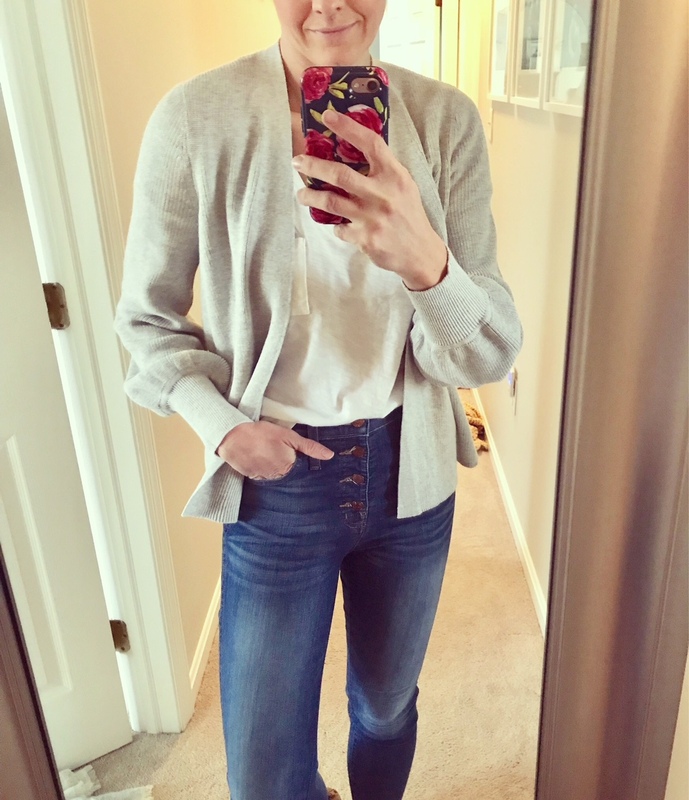 Another basic combo with another great spring sweater. I adore the sleeves on this one. Have a great weekend everyone! Enjoy watching the Royal wedding, I’m so excited!! Can you see that dark sky behind me? We captured these images minutes before the sky opened up. My husband was actually cracking jokes about how awful it would be if he caught me being struck by lighting on film. He’s got quite the sense of humor, that guy! Joking aside, I’ve been wearing these utility pants non-stop! Here’s another great option if you love the embroidery. 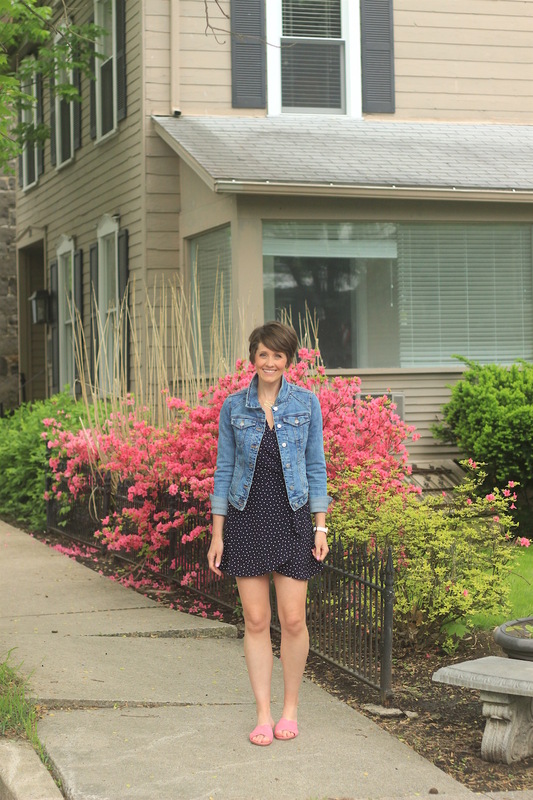 And this sleeveless sweater that I showed you in this post is already a favorite. I was actually asked if I made it myself, which I think was a compliment ;) I love the bright pink/coral but it also comes in a softer navy blend which is also beautiful. Happy Monday, all! I hope you had a great weekend. 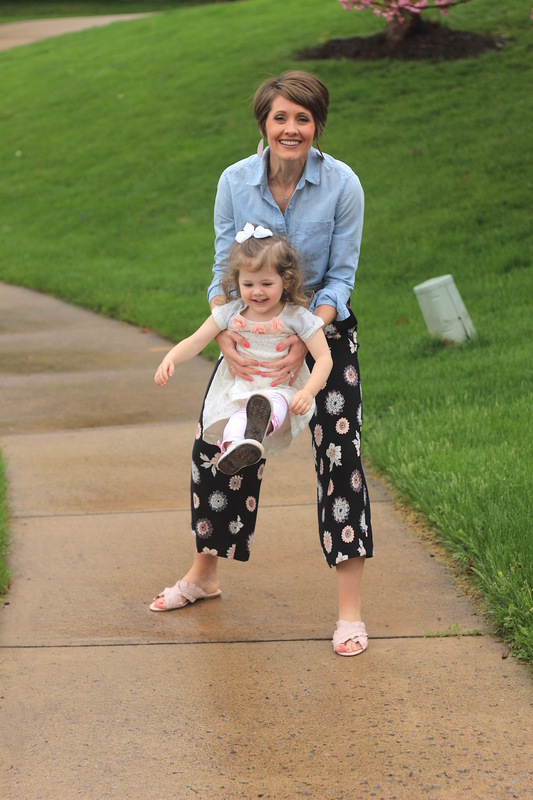 We spent Mother’s Day with family yesterday cooking out despite the rain that fell for the majority of the day. The kids and my husband made me breakfast in bed and then my girls quickly devoured every last bite, lol. That basically sums up motherhood, does it not?! The funny thing is that seeing that happen prior to being a mother would have driven me crazy. But as a mother, you somehow aren’t bothered but satisfied that your kids are being nourished. To this day, my mother would still give me anything off of her plate, as I’m sure yours would too! The rain did manage to ruin any chance of getting photos done with my littles, so instead I decided to jump ahead and share some of my favorite swimsuits as Memorial Day is only two weeks away! One-pieces are my go-to and I adore all of the different styles you can find them in. 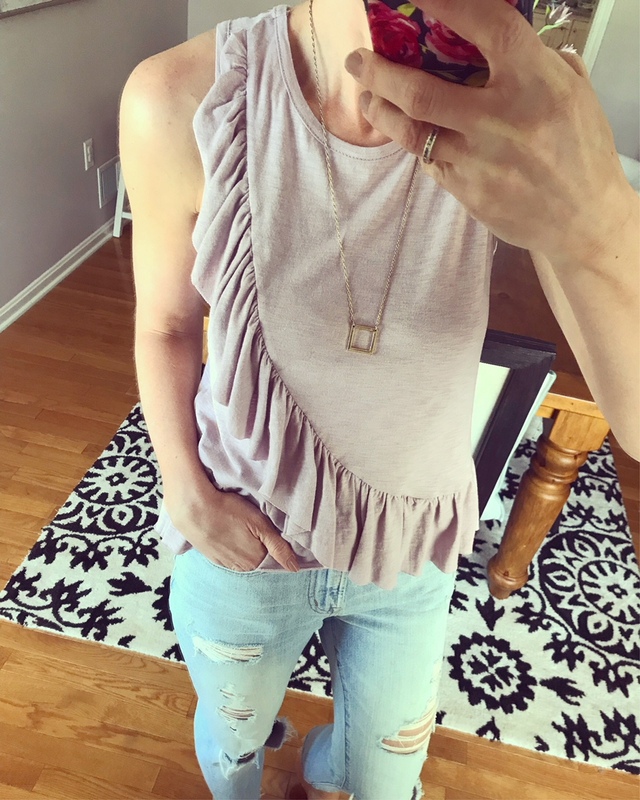 One shoulder ruffles (for under $20), Bold prints, pretty florals, fun cut-outs and stripes to name a few. I love a good solid suit as well, check out the criss cross back on this one. The best part is, I was able to dig up some of the best that are all under $100! I also recommend checking out your local TJMaxx. I’ve found a number of suits at great prices when I check early enough in the season. Once summer hits, they end up pretty picked over. Share in the comments which suit you’d pick. I’d love to hear what everyone is most drawn to! Happy Friday! 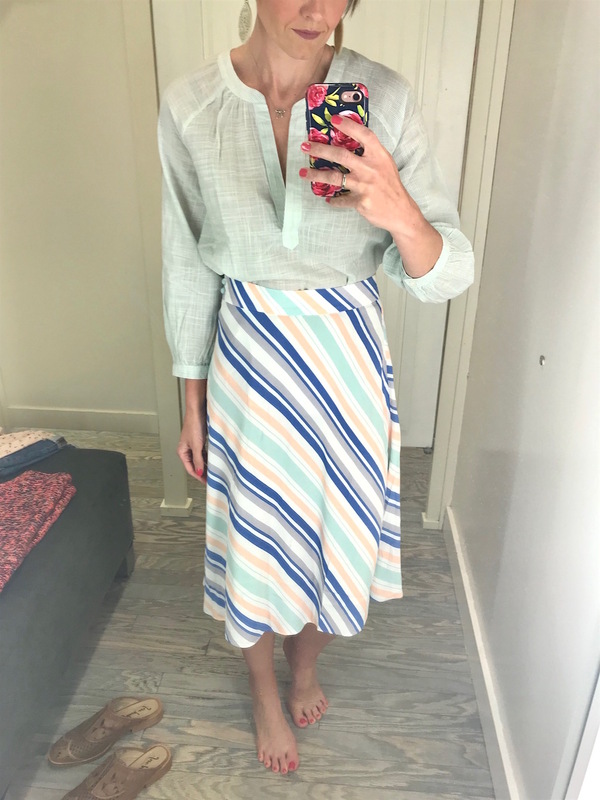 I snuck in to LOFT earlier this week and despite not having a ton of time, I was able to try on some new arrivals that I wanted to share. With a sale currently underway, I know it’s our favorite time to shop! There are so many bright, spring pieces both in store and online that are worth checking out. The only thing I’m missing is a bit of a tan! 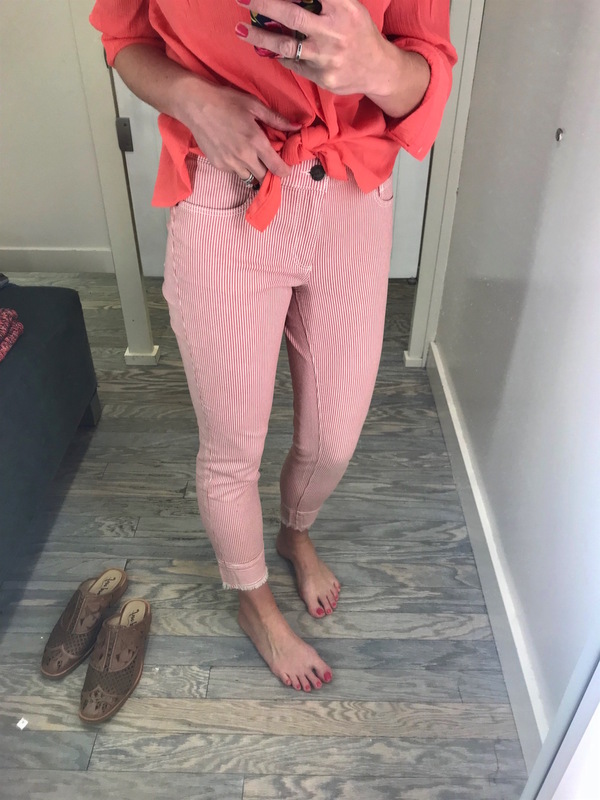 I was immediately drawn to this coral smocked top. 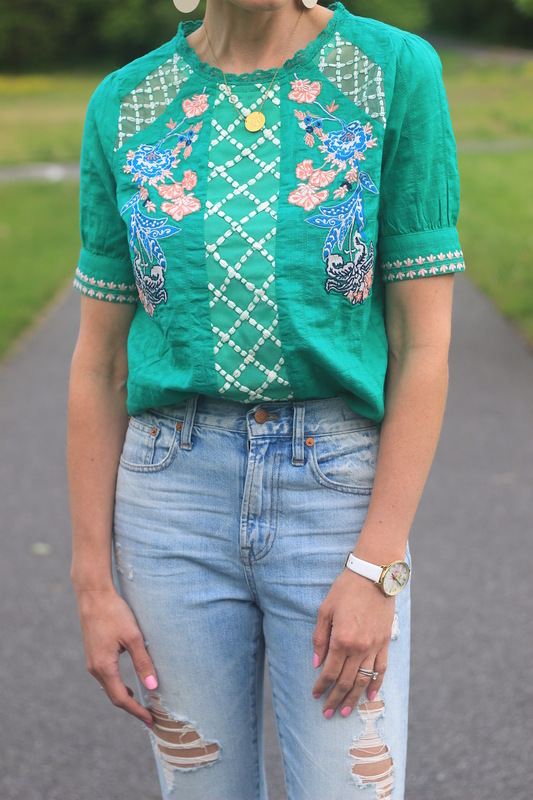 It could easily be tucked into trousers for work, or some fun floral pants! Light and airy and perfect for summer. 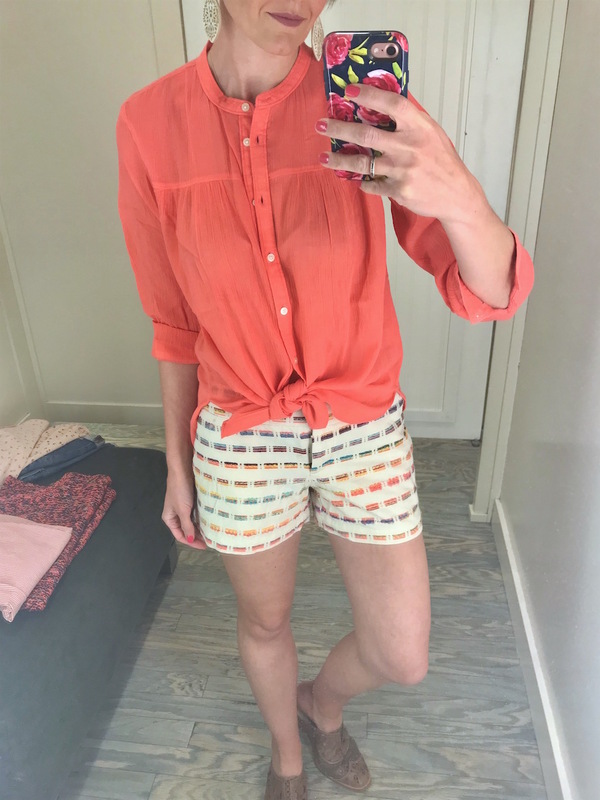 The shorts are adorable as well and have a flattering flat front. 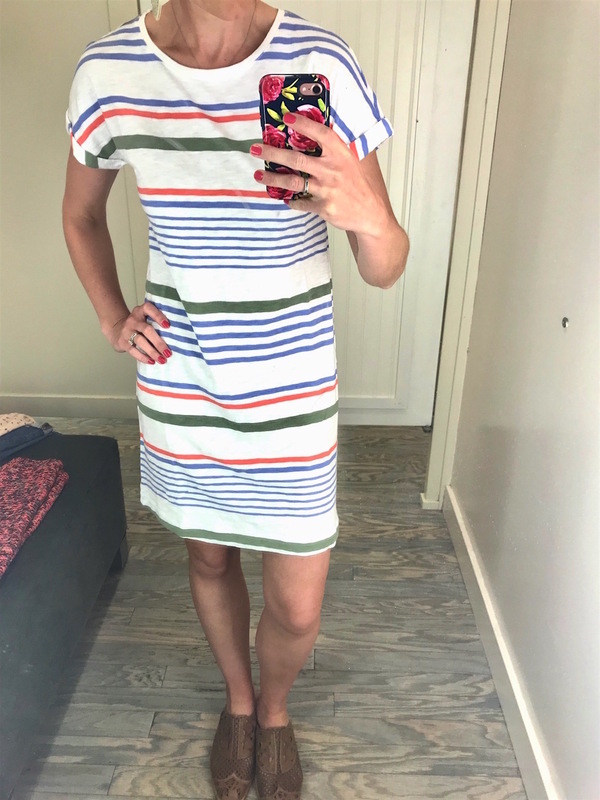 I love the mix of colors on this Lou & Grey t-shirt dress. It’s such an easy summer piece to throw on over a swim suit or with some white sneakers and a denim jacket to run around town. Another pretty striped piece was this skirt. 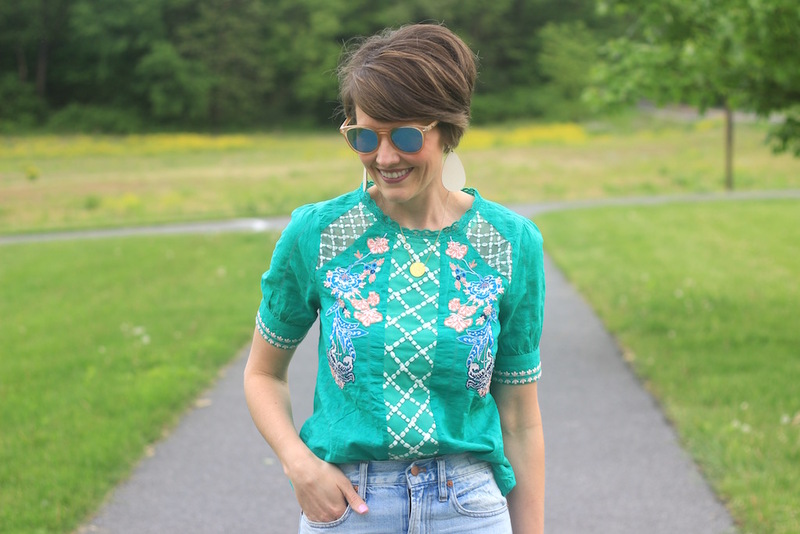 The colors again were right up my alley and I could see it being paired with any number of sweet, summer blouses and a pair of wedges. Great for work, church, showers etc. And this top is another winner. I’d end up pairing it with blue or white denim, a little front tuck and some statement earrings. 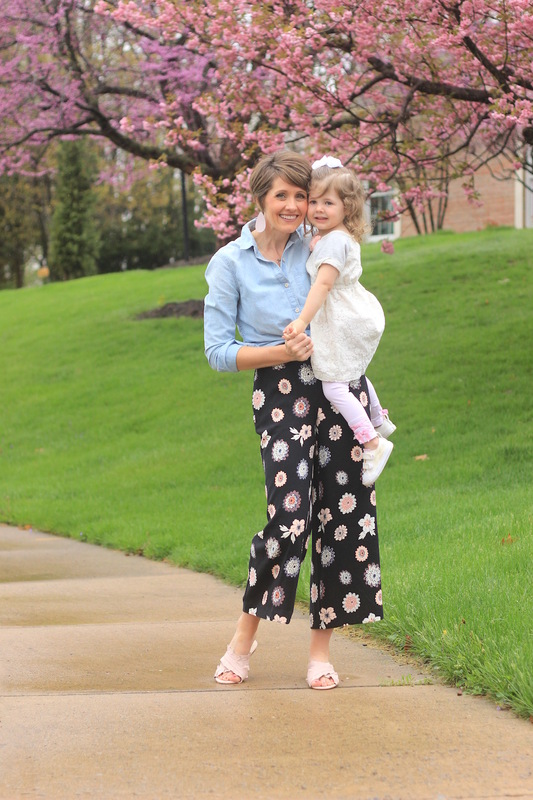 Floral pants for the win (as I was also discussing earlier this week)! They basically feel like you’re walking around in pj’s. I’d probably throw on a solid tee and denim jacket if needed. 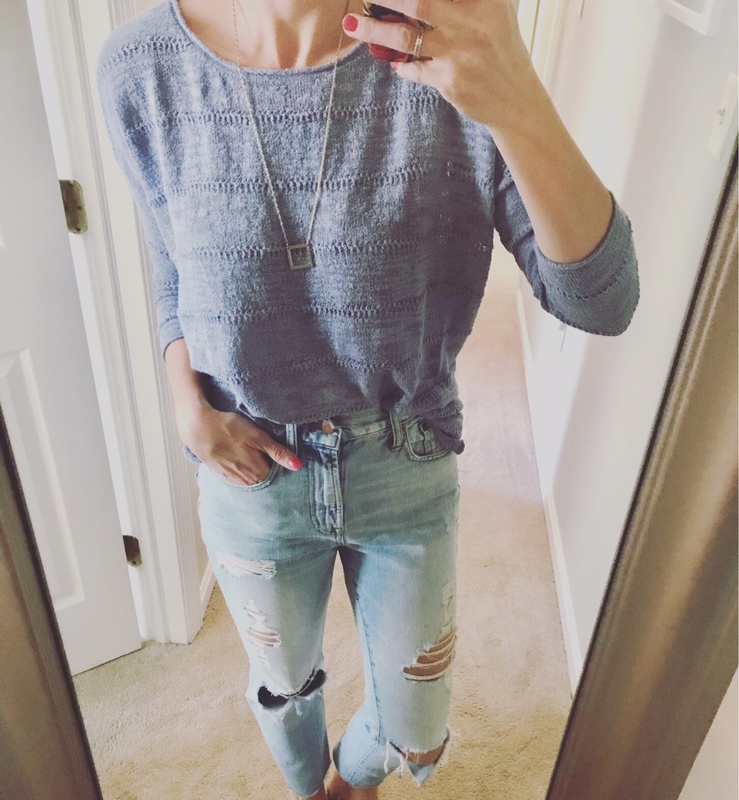 Love, love this sleeveless sweater. The colors are bold and bright in person and I couldn’t pass it up. You could pair it with trousers and a structured jacket for work, or dress it down with a pair of chambray pants as I did here. 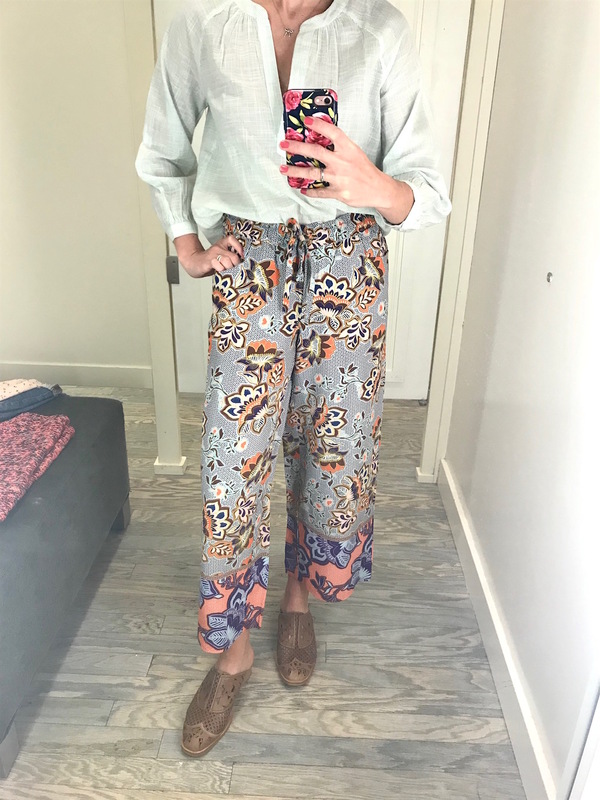 I can’t seem to track these pants down online yet, but I wanted to share for those of you that may be able to get to a store. 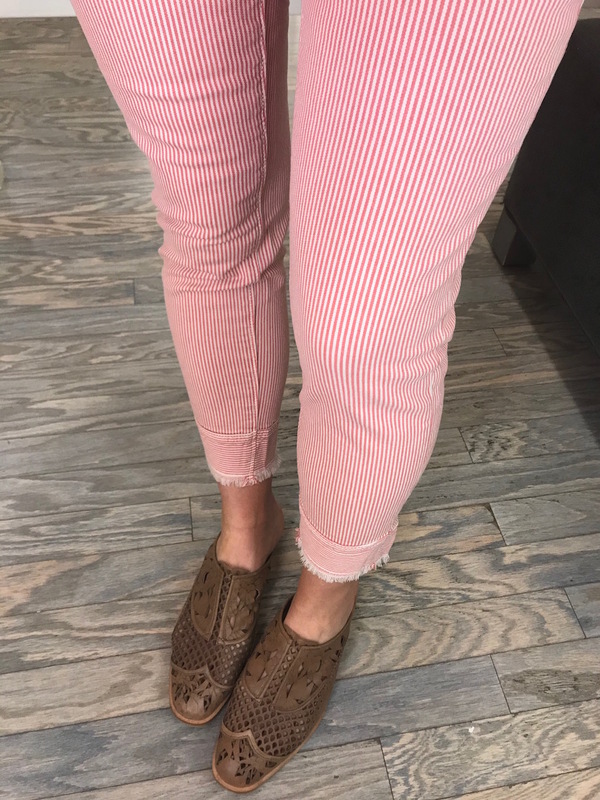 They didn’t have my size, so I can’t accurately judge the fit, but they are super cute with the striped print and raw hem. Very fun and playful for spring/summer! This sweater caught my eye at the end and I’m glad I didn’t miss it! I adore the soft blue and love the loose, airy fit! It’ll look so pretty paired with white denim. 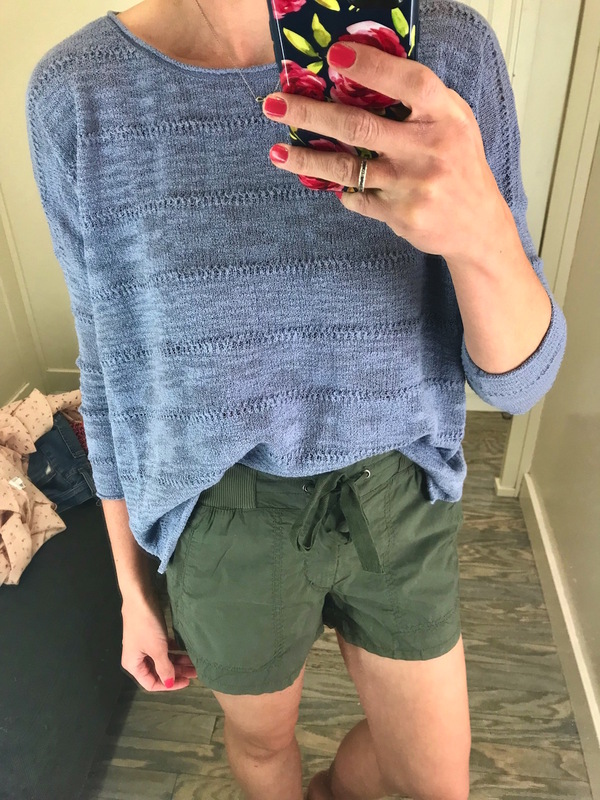 I wanted to try these shorts too, which make for a great casual short. They are Lou & Grey so you know the fit and comfort is right on! I found a few more favorites as I was browsing online, so I’ll share them below as well! I hope you guys have a wonderful weekend and I wish all of you mothers, grandmothers, aunts etc. a very Happy Mother’s Day! !